Tours depart from the patio area located behind the Visitor Center. The Gift Shop located inside the Visitor Center offers books, gifts, drinks, snacks and sandwiches. There is also a small art gallery that displays art on a rotating basis. 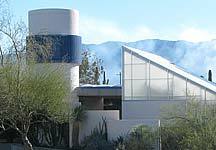 Additionally, many unique desert plant and cactus specimens are for sale from the Arboretum. Note: The Arizona State Parks Annual Pass grants admission ONLY to the gift shop.